The Tumbling National Finals were held last weekend at the Motorpoint Arena in Nottingham. Isabelle Henden and Ruby-May Sayer had done extremely well and qualified at both the regional competition and the semi-finals. 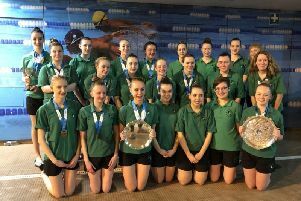 This earned them selection for the West Midlands Squad to compete at this national competition. Izzy and Ruby-May train at Rugby Gymnastics Club in Lower Hillmorton Road for ten hours a week. Izzy competed at level 2 in the 13+ age group and Ruby-May at level 2 in the 9 to 10 age group. Both girls were placed eighth and are now officially in the top eight in their category in the UK.